In the year 2000, NCL decided that cruising had become too stuffy, so it began redesigning its onboard programs and its ships to be more casual, down-to-earth, and just plain fun. The 93,502-ton, 2,394-guest Norwegian Pearl and her Jewel-class sister ships are the direct result of that makeover. Launched in 2006, Pearl is everything a mainstream American megaship should be, offering a festive atmosphere, great entertainment, a slew of restaurants, awesome children’s centers, fun decor, fantastic suites, and comfortable standard staterooms, all at a fair price. Click for deck plans and deals on Norwegian Pearl. Inside, the mood continues from the moment you come aboard, with fantasy furniture and artwork in the atrium lobby, an explosion of bright island colors in both the public rooms and accommodations, and a dash of contemporary and art deco styling in some of her fancier restaurants and lounges. Top of the wow pyramid is the Bliss Ultra Lounge, a moody nightclub full of velvet curtains, super-plush sofas and daybeds, dozens of TV screens for visual mood-setting, and four 10-pin bowling lanes to create one of the most modern hipster night spots at sea. Farther forward, the multi-deck Stardust Theater seats 1,000 guests for some of the best production shows in the cruise world, as well as performances by the great Second City comedy troupe. Kids get a huge, bright play area outfitted with cozy TV rooms, a huge climbing maze, and great crafts, play, and computer areas. There’s also a small play area outdoors. Teens get their own hangout space called the Metro Center. 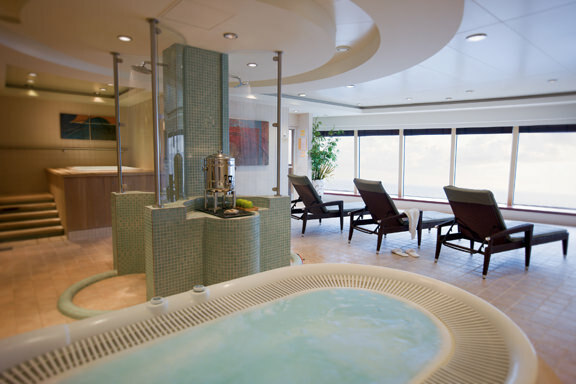 Kick back and relax in the sumptuous spa aboard Norwegian Pearl. 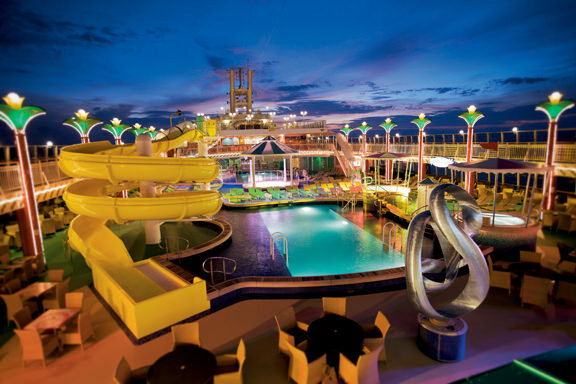 Photo courtesy of Norwegian Cruise Line. Outdoors, Pearl’s resort-like pool deck is hedged to port and starboard by a row of palm-tree-shaped street lamps, while a large, Bermuda-style gazebo bandstand sits in the center, among two pools, four hot tubs, and a two-story corkscrew waterslide. Up in the bow on that same deck is the ship’s amazing spa, with its multiple treatment rooms, saunas, beauty salon, and calming relaxation center with its own aquatherapy pool. A large fitness center is next door, and there’s a jogging track and a basketball/volleyball court outside. At the high end, Pearl offers 11 different categories of suites, many of them in its “The Haven by Norwegian” first-class section. Top of the heap is the incredible Garden Villa, with its three separate bedrooms, living room, dining room, and private garden. Most distinctive are the two-bedroom, 572-square-foot Family Villas and 440-square-foot Courtyard Penthouses, all arrayed around a private courtyard with its own small swimming pool, hot tub, and plush sun beds. 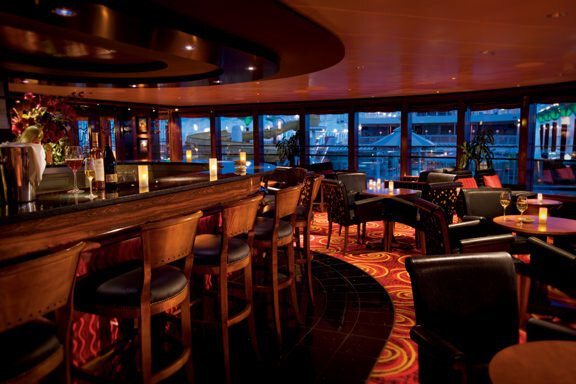 There’s also a private sun deck upstairs and a dedicated concierge lounge, all for the use of Haven guests only. 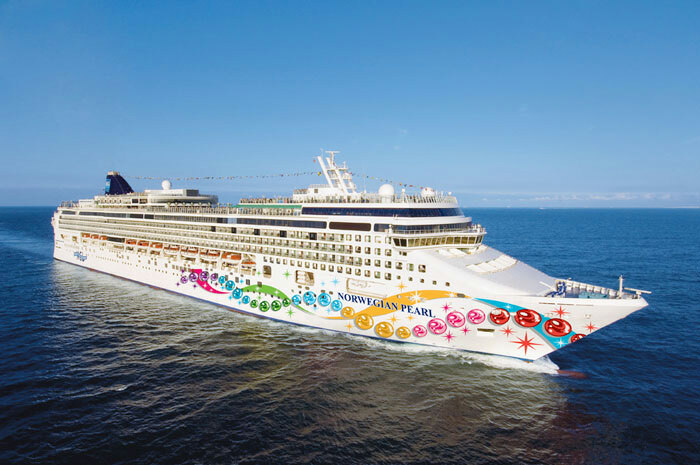 Sister ship to Norwegian Star, Norwegian Dawn, Norwegian Jewel and Pride of Hawaii, the 2,400-passenger Norwegian Pearl was to be an identical twin to Jewel, but top brass decided on additional features, such as an industry-first bowling alley; and two NCL firsts — a rock-climbing wall and two Deluxe Owner’s Suites. Read the rest of the story. Avid Cruiser Posts, Photographs and Videos Featuring Norwegian Pearl.